Amazing Tenerife houses in Santa Cruz. 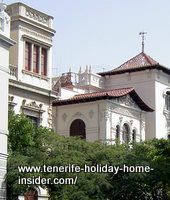 Tenerife houses of its capital impressed me greatly during my first visit of the Rambla Santa Cruz in 1997, already. Many huge mansions line this main avenue which is almost a central park town feature. The Tenerife mansion depicted beside is a stunning home just off the Rambla which is lived in by people that don't look like millionaires. Only their homes appear to be upper class. I met them when they left their residence to go for a ride. But then, Rockefeller also didn't look the part in his later life, so they say. This edifice with generous dimensions could very well be in the old quarters of New Orleans that was featured in the movie "Gone with the wind". 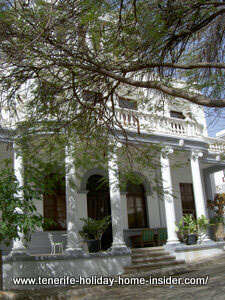 It has this classic colonial touch of an era where owners had many servants and threw lavish parties. I also discovered two very large dogs. They calmly gazed at me when they strolled though its garden. Shady old trees spread their healthy branches for man and beast in those town properties in the middle of a big harbor city. Admire other Art Nouveau structures depicted beside. Such town houses seldom surpass 1000 square meters. This area includes outbuildings and land. 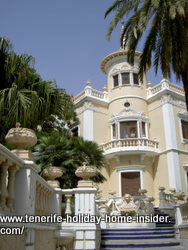 A young lady passed me to enter one of the perfectly renovated and groomed Tenerife houses in Calle Viera y Clavijo. The building had a round tower and many bay windows. She went to dentist rooms or rather to an entire dental clinic. The latter street joins the Rambla with Plaza de Patos (Place of ducks) or Plaza 25 de Julio. 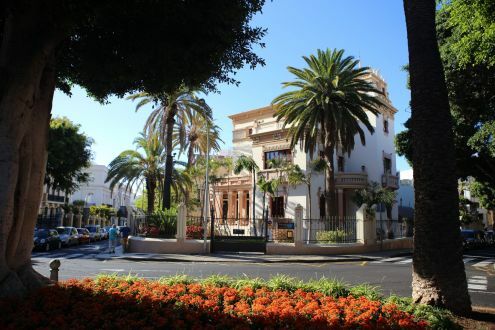 You will never get bored if you love looking at any type of architecture of houses in the green heart of the city of Santa Cruz de Tenerife. What also makes such a town trip so pleasant are the colors of blooms of all types. They greet you from hedges and shrubs over walls and fences as well as by the Rambla where one of my favorite taverns is found. They soften facades of pastel shades. They do so from near or from far. Sometimes a tree seems to bend over a neighboring property. Another row of Tenerife town houses of the center hint at more Art Deco. Those buildings could just as well be in any European street, such as in Bournemouth of the UK, in Amsterdam in the Netherlands, in Prag, in Germany or in France. The attached townhouses are of a different style. Some have beautiful masonry around doors and windows. Their structures are often more simple, yet elegant and practical for urban living. Much sturdy architecture which may be called Neo Classical belongs to government houses such as by the Parlament building. The ancient Free Masons' house is also very imposing, while it even has a Greek base and columns. . 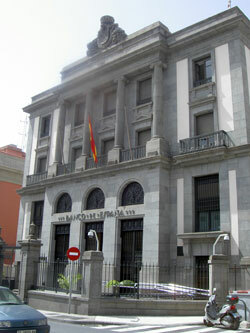 So is the Santa Cruz Tenerife Bank of Spain Banco de España, in my mind. However, its gray stone facade is somehow dull. The gay Spanish flag changes little. 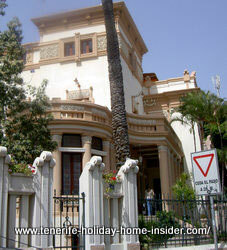 Discover the so called eclectic style 2nd empire architecture at the friendship club in the Tenerife capital here.